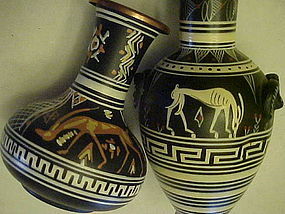 Here I have two vintage copper vases both made in Greece and hand painted with animal design and Greek key borders. One vase is 3" tall and perfect. The taller vase measures 4 1/4" but has two dents. The paint is perfect on both and the dents on the one are not real noticeable because of all the design work. The taller one also has Rams antlers for handles, which makes it exceptionally unique. I am selling both together for one price. I will be listing others, similar.